There is a big difference between animals slaughtered in an abattoir with an inspector present and a kangaroo shot in the bush among the dust, dirt and blowflies without any supervision. Ante mortem inspection that excludes animals that are showing signs of disease, is carried out by shooters who are more interested in numbers than health issues. The kangaroo meat industry’s failure to adhere to hygiene regulations is placing public health at extreme risk. 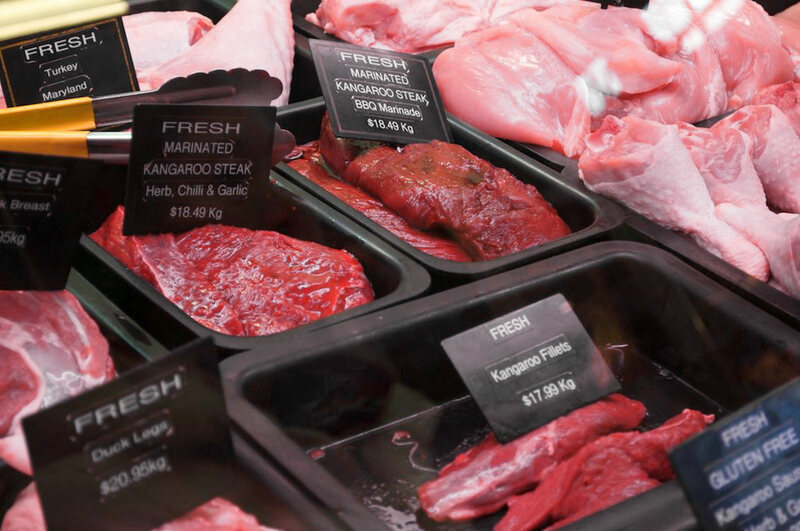 Dangerous levels of salmonella and E.coli have been found in kangaroo meat on sale at retail outlets and destined for human consumption. The industry is failing to adhere to the Australian standard which determines the conditions under which the animals are harvested, transported and stored. There is no enforcement of these standards. Most of them don’t know what they’re doing. 1. To rid meat of salmonella and other pathogenic bacteria, while cooking, the deep muscle tissues must reach at least 60 o C . But the tradition of serving kangaroo rare to avoid toughness means it is unlikely to reach such a temperature in the deep tissues. 2. As well as poisoning from salmonella and E.coli, diners on kangaroo meat sourced from unhygienic environments, also risk contracting other pathogenic diseases, including toxoplasmosis, which can result in foetal death or birth defects in affected women. e.g. a pregnant woman ate kangaroo meat and contracted toxoplasmosis, which was transmitted to her unborn baby. Her baby was born blind. 3. Until the shooters are required to protect the carcases while being taken to the refrigerated storage units there will always be contamination from contaminated dust. 4. The time taken in summer temperatures after the first kangaroo is placed on the outside of the truck until it reaches the refrigerated unit must cause the temperature to be in the extreme danger zone for multiplication of all pathogens. This can only be prevented by shooters carrying the carcases in refrigerated properly constructed units. In May 2010 their Sydney office was raided by NSW & Queensland police after accusations by the industry that activists had broken into chillers in northern NSW and southern Queensland and contaminated carcasses. Animal Liberation’s spokesman, Mark Pearson, denied the allegations and said all the chillers accessed were unlocked at the time the samples and video evidence were taken. Police said their investigations were continuing and no charges had been laid over twelve months later. The video footage showed paws and necks touching dirty floors stained with old blood, and fresh blood, kangaroo carcasses crammed so close together that it would be impossible for cool air to circulate adequately. It is essential that kangaroo carcasses in chillers have adequate space to allow the cold air to make contact with the whole carcass that still has not had the skin removed. Shipping containers are not suitable for refrigerated storage units. The videos also showed that a kangaroo shooter had blowflies and other insects in the spotlight and there were carcasses hanging on the back of his truck while driving along dusty dirt roads. The dust on the roads contains decomposing vegetable matter, dried faeces of farm animals and kangaroos as well as the dried blood of kangaroos from previous shootings carried on the trucks. The dust must be responsible for the high microbiological numbers. “ Executive chairman of Obesity Australia and Professor of Medicine at Monash University John Funder said given that kangaroos had more L-carnitine per gram than any other red meat, consumers should be wary of excessive consumption”. He said companies selling the meat may also have to reconsider how they market it, given that it is widely perceived to be healthier than other red meats. In 2009 dogs and cats were reported to be suffering from thiamine deficiency. The Author and Richard Malik,of Post Graduate Foundation in Veterinary Science, the University of Sydney investigated these cases and wrote an article tiled: Thiamine Deficiency Due to Sulphur Dioxide Preservative in “Pet Meat” – A Case of Déjà Vu. Firstly, we should advise consumers not to be seduced by the claims on the packaging. Most owners of companion animals wish to do the best they can for their pets. They are told that the contents of ‘pet mince’ and ‘food rolls’ are nutritious and provide the best quality meat for the animals. Furthermore, they are often cheaper than fresh meat fit for human consumption, more convenient to buy and sometimes do not require refrigeration. Owners should be informed that because there is no legal requirement to state the presence preservatives in these foods, their presence is not invariably advertised on the label. Secondly, we should explain that the use of preservatives does not prevent spoilage or putrefaction, but that rather it only masks the most revealing signs viz. the unsavoury odour and brown discolouration of the meat. Thirdly, we should draw pet owners’ attention to the fact that ‘pet meat’ has not necessarily been subjected to the stringent meat inspection and processing assessment that occurs for meat designated for human consumption. by Des Sibraa, a former NSW Meat Inspector who has seen it all first hand. Aust Vet J. 2005 Jul;83(7):408-11. Thiamine deficiency due to sulphur dioxide preservative in ‘pet meat’–a case of déjà vu. Malik R(1), Sibraa D.
I brought some of these last week & have them in the freezer feeling unsure weather to throw them out now. I was astounded to here this. 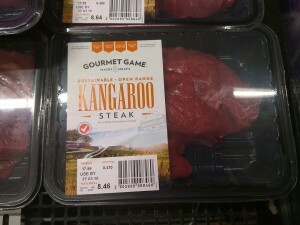 i would of assumed that kangaroo meat prepared for human consumption or for pets would be safe to eat. Have supermarkets been notified of this as they need to be until it can be investigated more. Would like more information on this please.